Nothing is more disheartening than pushing yourself in the gym, making consistent progress, meeting your goals and then finding yourself sliding backward. Strength is one of the most noticeable things to lose because you quickly realize that you are using less weight or performing fewer repetitions than normal during your workout. If you've been working the chest, shoulders, and triceps -- the main muscles used in the push-up -- with exercises like the barbell bench press and shoulder presses, switching to push-ups might make you weaker. When you use weights, you can easily increase the difficulty in exercises like the bench press and shoulder press because you're using equipment like barbells and dumbbells, which allow you to easily add weight. However, it's difficult to make push-ups more challenging. Read more: How Fast Do You Lose Strength After You Stop Lifting Weights? 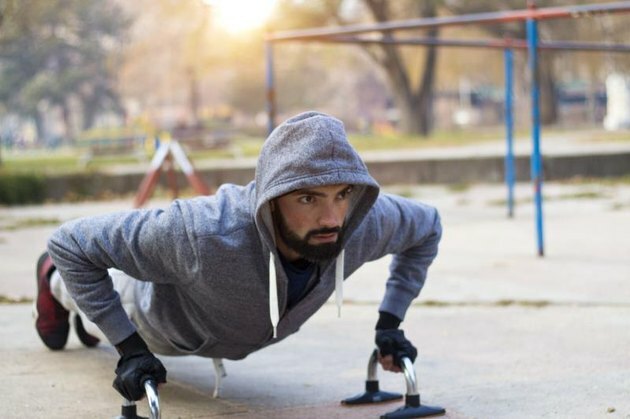 By adding weight in exercises that target the chest, shoulders, and triceps, you can make them much stronger than you would be able to with a simple body weight exercise like the push-up. The amount of resistance that your body weight creates in the push-up is less than the amount of resistance that you would use when bench pressing your body weight. That's because your feet are on the ground in the push-up and they carry some of your body weight, taking some of the stress off of the chest, shoulders and triceps. According to a study in a 2012 issue of the Strength and Conditioning Journal, you only have to support about 70 percent of your body weight with your upper body during a push-up, whereas you support 100 percent of the weight of the barbell with your upper body during a bench press. If you switch from doing weighted exercises like the bench press and shoulder press, you should expect to lose some strength in your upper body muscles. This doesn't happen because push-ups sap your strength, it happens because your muscles aren't getting enough stimulation during the exercise. Strength comes not only from the size of your muscle but from the nerve's ability to make the muscle contract. Nerves that go into your muscles essentially shock the muscle, which makes it contract. You can get stronger if the signal from the nerve becomes stronger. You can also get stronger by making your muscles bigger, but this takes longer than getting your nerves to increase their strength. On the other hand, your nerves quickly lose the ability to powerfully shock the muscle into contracting, while it takes a long time to lose muscle mass. In fact, according to a 2002 study in the American Journal of Physiology, this loss of strength in the nervous system can happen in as little as two weeks with no training. If your muscles no longer need to move a large weight then they will quickly lose strength. They need to be stimulated in order to stay strong. Fortunately, you can avoid getting weaker by either keeping one day of strength training in your program, according to a study in a 2011 issue of the Journal of Strength and Conditioning Research. Typically, you only need one serious strength training session per week to maintain the amount of strength that you've worked so hard to attain. If you want to switch to performing push-ups it's still a good idea to keep a strength exercise like the barbell bench press in your repertoire once per week. If you can make that compromise then you shouldn't lose any strength. If you can't continue the weighted exercises that you were doing before the bench press then you should try to use a different variation of the push-up. The standard push-up requires much less strength than a one-armed push-up, for example. You can also perform push-ups with your feet on an elevated surface, push-ups with a weight on your back or push-ups while wearing a weighted vest. Any of these variations will increase the amount of resistance to your chest, shoulder, and triceps muscles during the push-up, which will help you to maintain strength. The effect of position on the percentage of body mass supported during traditional and modified push-up variants. Effects of in-season strength maintenance training frequency in professional soccer players.